We’ve spent a lot of time over the years telling you about good, inexpensive alternatives to pricey devices. Today, however, we’re going to do the exact opposite. Bear with us. 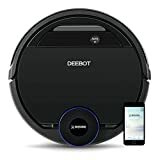 Yes, it’s true that you can get a very good robot vacuum for $200, $150, or even $100 thanks to all the competition in the market. As good as budget models have gotten in recent years, however, they’ll still never be as good as some of the high-end robotic vacuum cleaners out there. The top-of-the-line Roomba used to be our favorite premium model, but now there’s a new sheriff in town. The ECOVACS DEEBOT OZMO 930 Smart Robotic Vacuum is our new favorite by a landslide. It provides suction and overall performance that match the $700 Roomba 960, but you also get a built-in mopping feature that you won’t find on any Roomba. If you’re looking for the king of robot vacuums, look no further. How does this $12 Bluetooth tracker have the simple feature missing from Tile’s $30 tracker?